Roy Kennedy, like many Aboriginal artists, came to art-making late in life. As he says, "I am living proof that you're never too old to learn". Kennedy studied painting and later etching at the Eora Centre in inner city Sydney. Etching is his preferred medium and one that has revealed his strength of vision as an artist. Kennedy's work shares many similarities with other successful Eora graduates, such as HJ Wedge and Elaine Russell, whose works have also entered the AGNSW collection. Like these artists, Kennedy has forged a distinctive style that contributes to the growing strength of Indigenous art practice in urban centres. "Pepper Tree Avenue was on Warangesda Mission where my mother was born in 1910. This mission was closed down in 1925, so all my people were scattered everywhere. Eventually they were moved to the mission on the police paddock, from there on all the old people were classed as fringe dwellers". Kennedy came to Sydney, and enrolled at the Eora Centre, after an itinerant life as a seasonal worker. 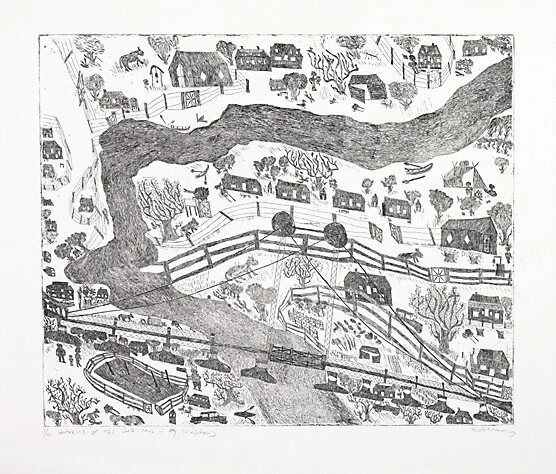 'Memories of the good days in my childhood' is from his second group of etchings and demonstrates his facility with the technique. As a body of work they are strikingly detailed in their depiction of his first hand observations and experiences of a chapter of Australia's history that is finding increasing expression in the work of Indigenous artists.